The Society is sad to announce the passing of Jean Preston on 22nd January 2019. Jean was an amazing person, who found time to get involved in a wide range of community and charitable activities, and she was very well known in her local community. Her love of heathers and concern for environmental conservation led her to joining The Heather Society in 1990, and we were fortunate to gain a member with such energy and organisational ability. Her invaluable contributions to the Society began almost immediately, when she was closely involved in the Harlow Carr heather trials with her soon-to-become husband Albert Julian. She and Albert co-authored two papers in the 1992 and 1993 Yearbooks on “Heathers in Yorkshire”, which among other things described the heather planting at the handsome new entrance to Harlow Carr Gardens, a planting in which they played a major role. Those beds continue to provide a dramatic colourful welcome to visitors to the Garden today and are a fitting testament to Jean. Sadly Albert passed away in 2001, but Jean continued to serve the Society as a member of Council for another 11 years. Jean’s first official Society appointment was as slide librarian in 1992, and during 1993 she was appointed to Council. In 1999 she took on the office of Registrar, with responsibility for registering new cultivars. In 2001 she became Secretary, a position placing particular demands on her time and one which she held for 11 years, finally stepping down in 2012 to continue in her less stressful role as custodian of the Society’s slides. During all these activities Jean somehow also found time to resurrect the Yorkshire Heather Group, which had faded away after the demise of its organiser Ken Barraclough, and as Secretary and Treasurer for the Group she organised talks and visits for the membership. 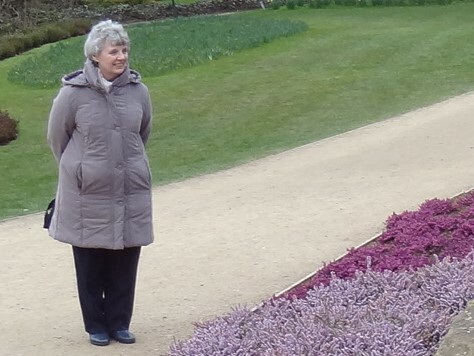 The meetings were held at Harlow Carr, where Jean’s many contacts with the Garden’s hierarchy proved invaluable. At these meetings she also provided refreshments, often in the form of delicious cakes and biscuits of her own baking. Jean also had a broad knowledge of the practicalities of heather propagation and growing and was always happy to share this knowledge with others. She will be sadly missed by so many. The Society extends its condolences to Jean’s husband Mike.